Mima’s Pumpkin Roll is a family tradition! 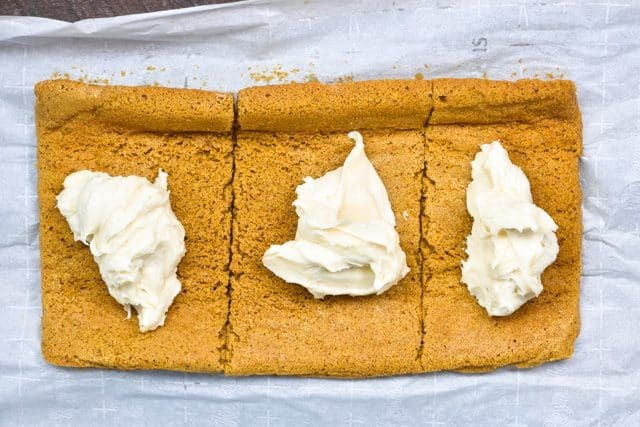 We’ve been making this easy pumpkin cake roll recipe for years. It makes one large or three small cake rolls, perfect for giving. On my first Christmas with my in-laws, my mother-in-law (the grandkids call her Mima) gave us a pumpkin roll. It was all wrapped up in plastic and she told me she made them every year as gifts: she would make one cake roll into three smaller ones which was the perfect size for giving. I devoured that cake roll and every one we received after, until she stopped making them because I became the one who gave desserts in the family. For 10 years I was in awe of these little cake rolls. They seemed like the magical unicorn of dessert; how the cake was pliable and wound in a spiral with a delicious cream cheese filling. How ever did she make them so perfect? After I started blogging, Mima gave me a cake roll pan for my birthday. She knew I was fascinated by making them; she explained in great detail how she’d bake the cake and roll it hot, how she’d use a kitchen towel covered in powdered sugar to prevent sticking, and how the cake would magically unroll after it was cool. Finally I decided to make my own cake roll. It wasn’t perfect but I was shocked at how easy it was. After that came my carrot cake roll with a photo tutorial, then the peanut butter cup cake roll with the video tutorial, and so many other cake roll recipes. Cake rolls kinda became my thing, if you will. 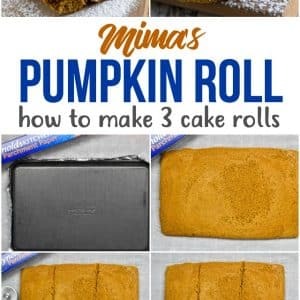 I realized…I’ve made chocolate cake rolls and lemon cake rolls and birthday cake rolls, but I’ve never just plain old posted Mima’s Pumpkin Roll. After 8 years of blogging, I figured it was time. 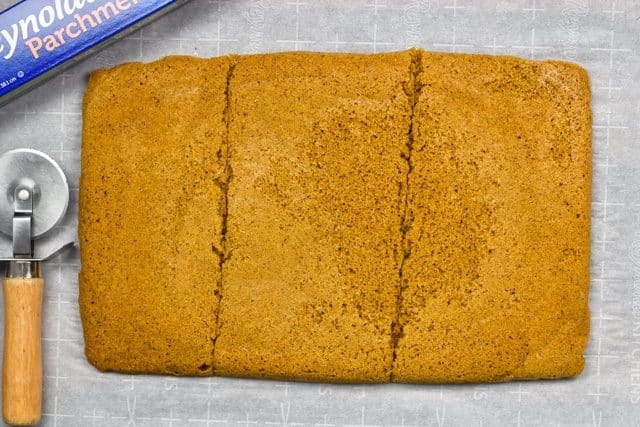 This easy pumpkin roll recipe can be made as one large cake roll or three small ones, for giving, just like Mima used to do. 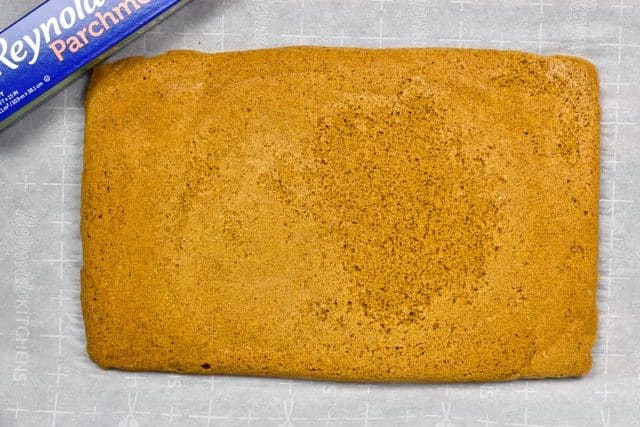 Sometime around the time that my peanut butter cup cake roll video went viral, someone told me that instead of using a kitchen towel and all that messy powdered sugar for rolling, she used parchment paper. I was intrigued: less mess? Count me in! If you’ve ever wondered about making a pumpkin roll with no towel, then this is the tutorial for you. I decided to use parchment paper for this cake roll and guess what? It worked! No powdered sugar mess or stained towel anywhere! 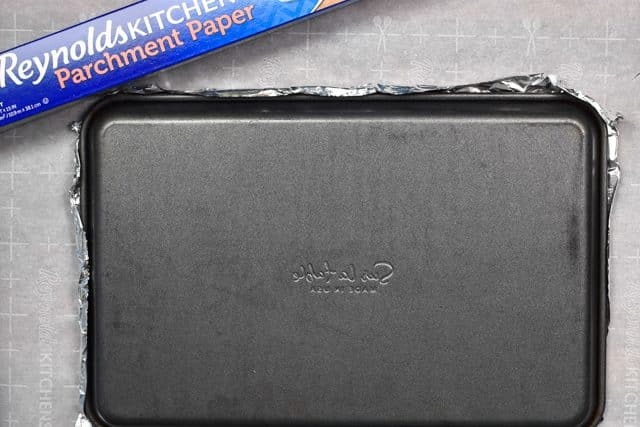 Just easy-to-use parchment paper. Have you ever wondered how to make a pumpkin roll? I’m going to show you that the magic is really easy and you can do it too. First, you have to make your batter. The most important thing when you’re making a cake roll is to beat the eggs at least 3 minutes. I like to do 3 minutes if I’m using a stand mixer and up to 5 minutes if I’m using a hand mixer. The eggs need to get thick and foamy and be a rich yellow color. This will ensure a spongey cake. If your cake ends up dense and thin, it’s probably because you didn’t beat the eggs long enough. Once you mix in the pumpkin and sugar, you can mix in all the pumpkin spices that make a pumpkin roll taste like fall. How do you know a cake roll is done baking? I use the finger test to know when my cake roll is done. The cake shouldn’t come off on your fingers and it should bounce back at you. Err on the side of over done instead of under cooked. A raw cake is going to fall apart! Then, once the cake is baked, the magic happens. The key word I use when making cake rolls is: HOT. Do everything while it’s HOT! Spread out a sheet of parchment paper and flip the hot cake out on top of it. Be careful not to burn yourself. Peel off the pan and foil. Do you want ONE PUMPKIN ROLL? Do you want THREE MINI PUMPKIN ROLLS? Use a knife of pizza cutter to cut your cake roll into three strips. Then use the paper to roll up the cake. Make sure it’s rolled tightly and if needed you can wrap the whole thing in a towel to keep it rolled tight. Let it cool completely, about 2 hours. While the cake is cooling, make the cream cheese frosting filling. Pumpkin and cream cheese go so well together! Once the cake is completely cool, carefully unroll the parchment paper. The cake will stick a little bit but it should peel up just fine. Frost each section (or the entire thing) with the cream cheese filling. Roll them back up tightly. Wrap with plastic wrap and chill until ready to serve or give as gifts. I like to sprinkle with powdered sugar before serving. These mini pumpkin rolls are the perfect gift for the holidays, or they’re the perfect dessert for a dessert buffet. 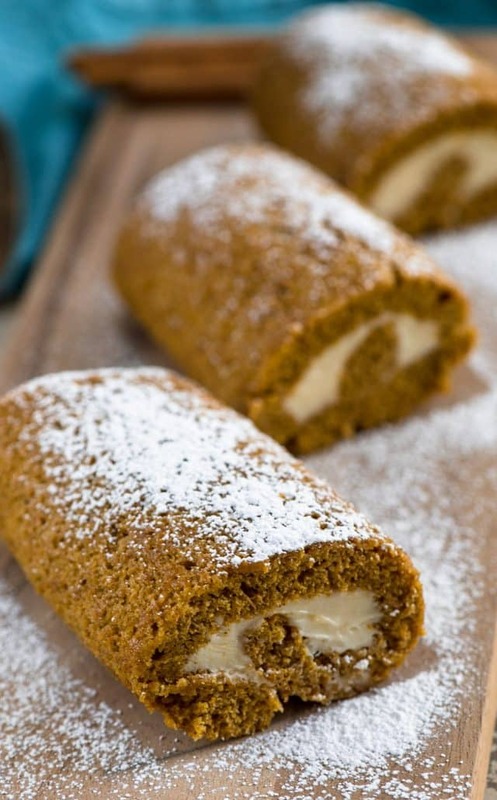 This classic pumpkin roll recipe is easy and perfect for fall. It’s full of pumpkin spices and filled with a heavenly cream cheese frosting. I hope you enjoy Mima’s Pumpkin Roll recipe as much as we do! 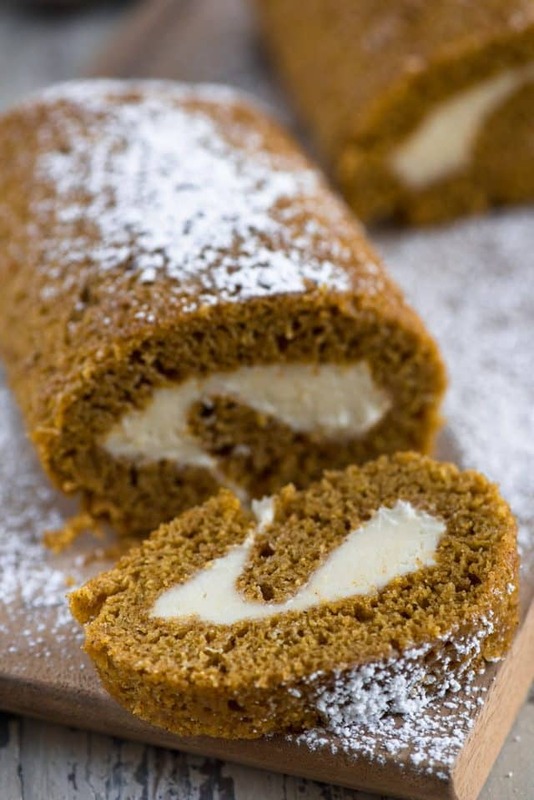 Mima's Pumpkin roll is a family favorite recipe. 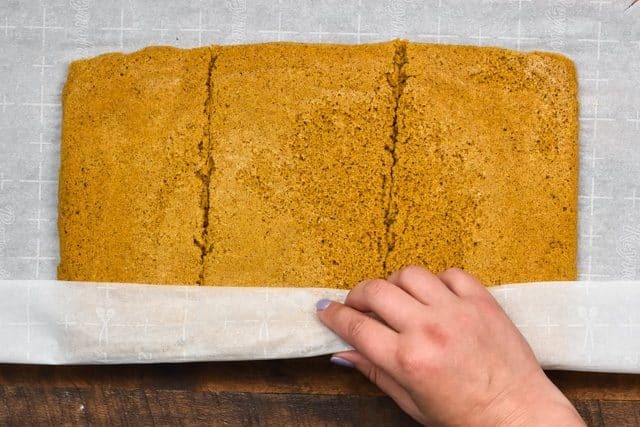 Make this cake roll large or make three mini pumpkin rolls that are perfect for giving! Preheat oven to 350°F. Line a 10x15-inch jelly roll pan with Reynold’s Wrap spray with nonstick cooking spray for easy removal. Beat eggs at high speed for 4 minutes, or until the eggs are thick and dark yellow and foamy. Mix in sugar until combined. Add pumpkin puree, lemon juice, baking powder, spices, and salt, mix until combined, then slowly mix in the flour, scraping the sides of the bowl as needed. Place cake batter in prepared pan and spread into an even layer. Bake for 11-15 minutes or until it somewhat bounces back when you lightly press it (and the top of the cake doesn’t stick to your fingers). A toothpick will come out clean. While the cake is in the oven, lay out a sheet of parchment paper. Remove the hot cake from the oven and immediately flip it over (careful not to burn yourself) and remove the pan and foil. 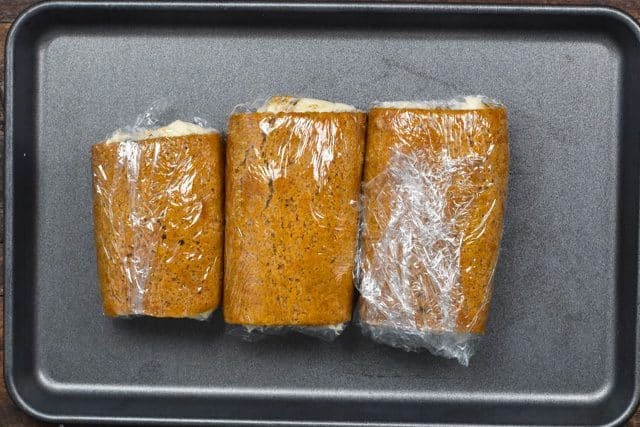 If you want to make three small cake rolls: slice the cake into three equal pieces. Leave it on the parchment paper. Roll up the cake using the parchment paper. Let sit at room temperature to cool, about 2-3 hours. Make the filling: beat cream cheese and butter until creamy, then mix in powdered sugar one cup at a time. Add the vanilla and heavy whipping cream until smooth and frosting is spreadable. Assemble the cake: carefully unroll the cake from the parchment paper. It may crack, but that’s okay, just be gentle. Add equal amounts of frosting to each section of cake. Roll up each cake roll. Wrap in plastic wrap and chill until ready to serve. For serving, dust with powdered sugar. You can make this as one large roll or three small ones. Store in refrigerator for up to 3 days or wrap well in plastic wrap and freeze for up to one month. Be sure to check out all of my cake roll recipes as well! 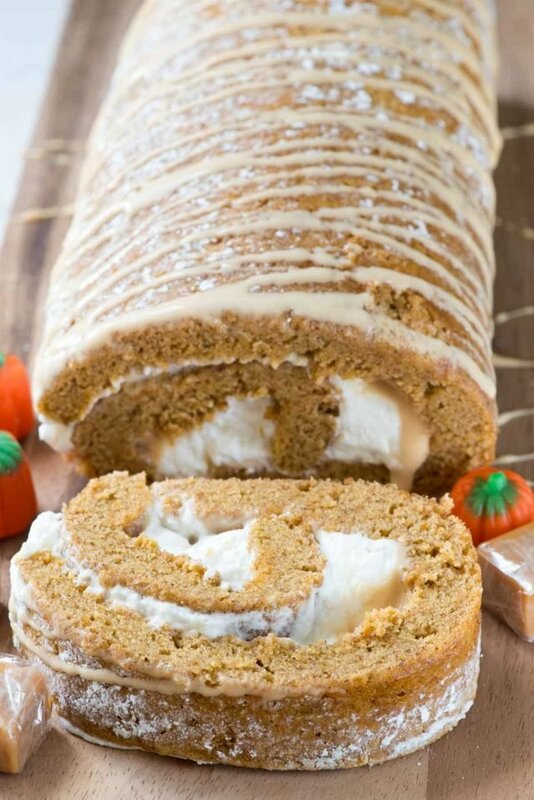 Caramel Pumpkin Cake Roll is also like Mima’s! 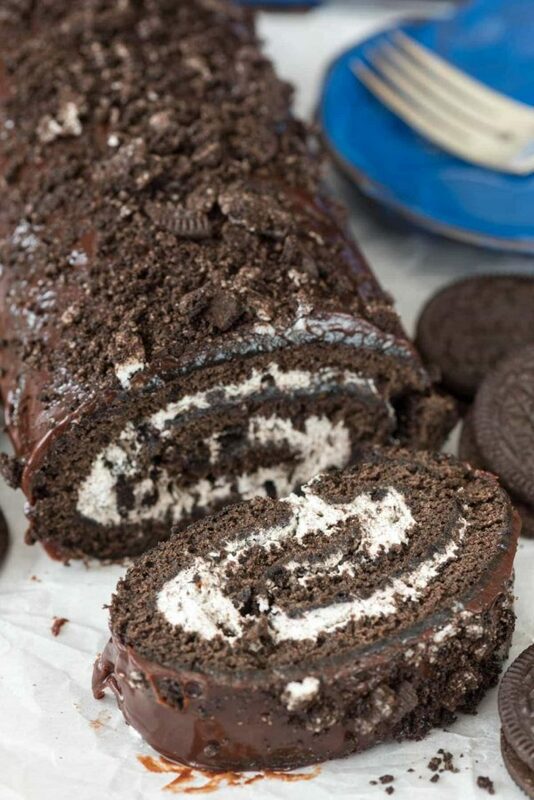 My Oreo Cake Roll is always a hit! 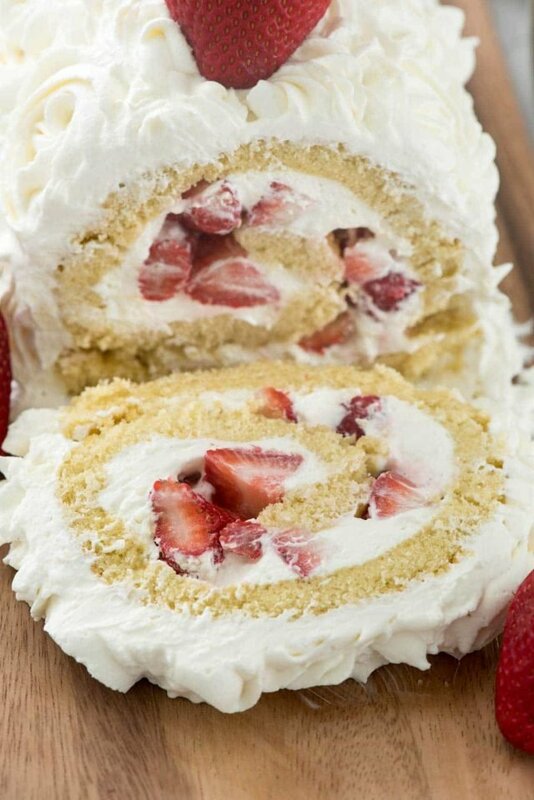 The strawberry shortcake cake roll is gorgeous all year long! I miss those; they were sooooo goooood! Can these be frozen to be gifted later? Maybe without the filling?